TS Half day schools from 15th March during summer 2019 | Half day School timings,Time Table 2019.Telangana State Half Day Schools from March 15th, 2019.Half day schools schedule declared in AP. The Commissioner of School Education, Telangana State, Hyderabad Proceedings to all the RJDs of School Education and all the DEOs in the Telangana state and certain instructions has been issued on TS Half Day Schools during Summer from March 15th, 2019. vide TS CSE Proceedings .Half Day Schools will be commences from 15th March, 2019, Half day schools will continue as usual from 15th March 2019 to 12th April 2019. In the High Schools with SSC Examinations centres the school timings will be from 1.00 PM to 5.00 PM . RC.No.843/Plg-I/2018 Dated:07.03.2019 Sub:- School Education — Implementation of Half Day Schools during summer and implementation of optional holidays for high schools — Orders issued - Reg. All the Regional Joint Director of School Education and District Educational Officers in the State are hereby informed that implementation of half day schools during summer and optional holidays for high schools as given hereunder. Half Day Schools:- Half Day Schools during summer i.e from 15th March onwards till last working day i.e 12.04.2019 of the academic year 2018-19. The schools i.e Primary, Upper Primary and High Schools of all managements i.e both Govt.. Govt. Aided and Private management will function from 8.00 A.M to 12.30 P.M. Mid Day Meals shall be provided at 12.30 P.M. Th respect of High School having SSC examination centers, the school timing will be from 1:00 P.M to 5:00 P.M as per earlier orders in vogue. All the Regional Joint Director of School Education and District Educational Officers are directed to communicate the above orders to the Schools functioning under all managements and monitor the implementation. Vide reference 4 cited, it was decided that the half day schools will continue as usual from 15th March 2019 to 12th April 2019. In the High Schools with SSC Examinations centres the school timings will be from 1.00 PM to 5.00 PM as per earlier orders in vogue. 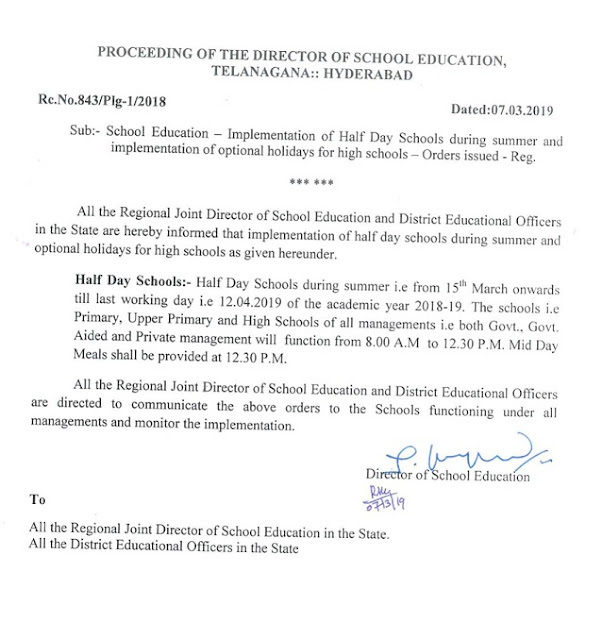 Sub: School Education, Telangana - Implementation of Half Day Schools during summer for high Schools - Certain clarifications on School timings - Orders issued - Reg. Ref: Proc.Rc.No. 848/P10/2018, IM: 12.03.2018 of C&DSE, TS, Hyd. aoOo All the RJDSEs & District Educational Officers in the State are hereby informed that side ref. cited orders have been issued on the implementation of the half day schools- killowing are the further clarifications regarding School timings. All the RJDSEs and District Educational Officers are directed to communicate the above orders to the Schools functioning under all managements and monitor the implementation. Optional Holidays will be applicable for Schools rather than individual teachers. The earlier practice of utilization of Optional holidays to the institutions shall be continued. #Half day schools Time Table, #Implementation of new academic year for 2019-19, #Text Books distribution and maintaining Book Bank, #Implementation of 3-R's Programme, #Improving the basic competencies in reading, #writing and arithmetic for all students in primary, #Upper Primary and High Schools.